JOLLY TIME Pop Corn a family tradition since 1914! They know their popcorn, and rather than keep it the same as it has been, they are always striving to make it better and healthier. Who doesn't love a great tasting, yet healthy snack? They do not skimp on flavor, only make the wonderful taste that much healthier for us! 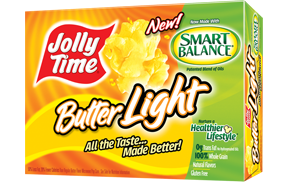 We loved the heart shaped popcorn bowl to signify heart health with the new Smart Balance patented blend of healthy oils. The flavor was outstanding as always! We are big popcorn eaters in our home. Popcorn is the perfect snack for you if you are just in need of a mini bag, or if you are a big family and popping an entire box. We love to pop some JOLLY TIME when we watch TV as a family. Check out some of the great Healthy Choice recipes you can make using JOLLY TIME. JOLLY TIME Pop Corn is having a giveaway on their Facebook page! I received coupons to giveaway from JOLLY TIME as well! I am sending 3 coupons to 1 winner in the USA. These are for a 3 pack box of JOLLY TIME Pop Corn. I love either Kettle Style or regular butter flavored popcorn. Kettle corn is my favorite. Butter with lots of butter. I know it is not good for you, but at our house we love the extra movie theater butter kind. So so good!! Regular butter popcorn is good for me. I like thr 100 calorie microwave packs for an afternoon snack. Any kind really--plain with salt is my favorite. I am a regular butter and popcorn salt kinda girl. I like caramel corn when it's fresh. I really like caramel corn but I can't find a brand that is easy to fix that tastes half way decent! The only way to get it is by the homemade method till I can find a good brand. Lots of butter and salt! I like movie theater butter but my family loves kettle corn! I like kettlecorn but more often than not, just good old fashion, stove top popped corn is our favorite. I like kettle corn! Yum! I like cheesy popcorn -thank you.